Inspirational and achievable is a mantra for BBC Gardeners’ World Live making the show one of the highlights on the gardening calendar (15th to 18th June, 2017, NEC Birmingham). Last year, the APL Avenue made its debut at the Show and proved highly popular with visitors. 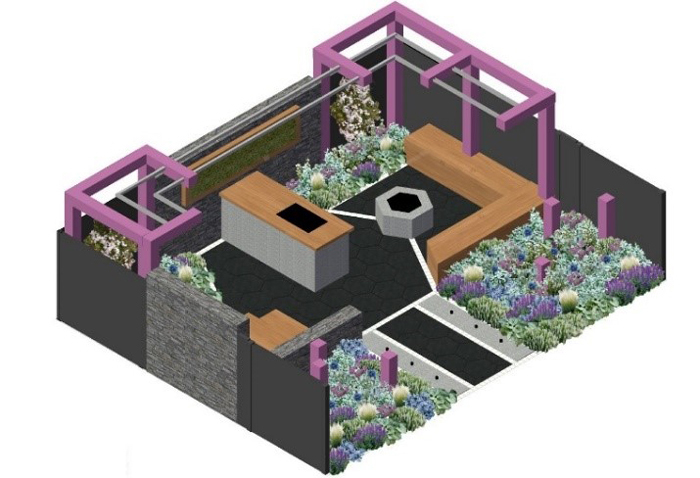 It returns for its second year in 2017 giving an opportunity for five landscapers, contractors and chosen designers to build gardens at the Show. APL Avenue is a show garden competition run in conjunction with The Association of Professional Landscapers and with a front or small back garden theme, the gardens are not only inspirational but also easy to relate to for the 90,000 visitors who come to BBC Gardeners’ World Live over the four days of the Show. The five winning contractors and designers who will be building Show Gardens on APL Avenue this year include, ‘It’s Not just about the Beard’ garden, designed by Peter Cowell and Monty Richardson for contractor Living Gardens, features a back garden created for a couple who live on the fringes of a city society. With no plans to settle down with children’ they are looking to change their current concrete yard into an oasis of urban greenery, inspired by the industrial themed local bars and clubs. An outdoor bar made from reclaimed materials, along with a place to grow fruit and veg, feature. 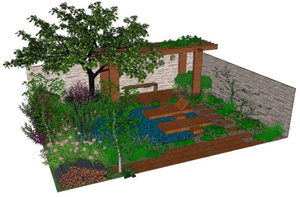 The ‘Big Fish Landscapes Garden‘ designed by Cherry Carmen, (Cherry Blossom Landscapes) is a back garden designed for a middle-aged couple looking to upgrade their garden to match their renovated house. It contains an innovative decking area that converts into lounge chairs and a moss graffiti wall, a wildlife friendly way to introduce art into the garden as well as spruce up a plain wall. Artemis Landscapes ‘Living in Sync‘ (pictured below) Garden,is a front garden designed for a professional, urban couple, taking inspiration from their keen interest in biodiversity, combined with their community spirit to transform the space from tarmac into an inspiring paradise for wildlife, with year-round plant interest and alluring details. 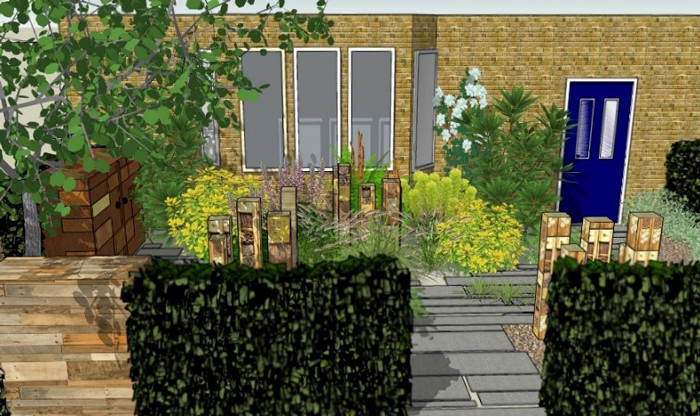 To combine stimulation and practicality, features of the garden include wildlife-friendly planting, sculptural bug towers, functional bin and bicycle storage made from sustainable wood and recycled paving. A Crab Apple tree will be a main feature with borders of the garden surrounded by embedded recycled bottles giving flashes of jewelled colour in sunlight. The garden is designed by Viv Seccombe and is sponsored by Neal’s Yard. 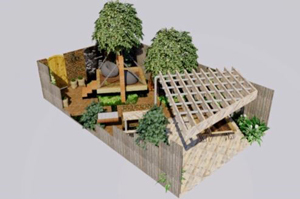 Contractor Lanwarne Landscapes, will build the ‘Lanwarne Landscape Garden‘, (pictured above) designed by Martin Lines. The design features a back garden for a couple in their early thirties to complement their modern refurbished house and offer a private space for them to relax. The garden includes an outdoor kitchen and fire pit created from granite and stainless steel to give a clean, contemporary edge which is balanced by bee and butterfly friendly planting. 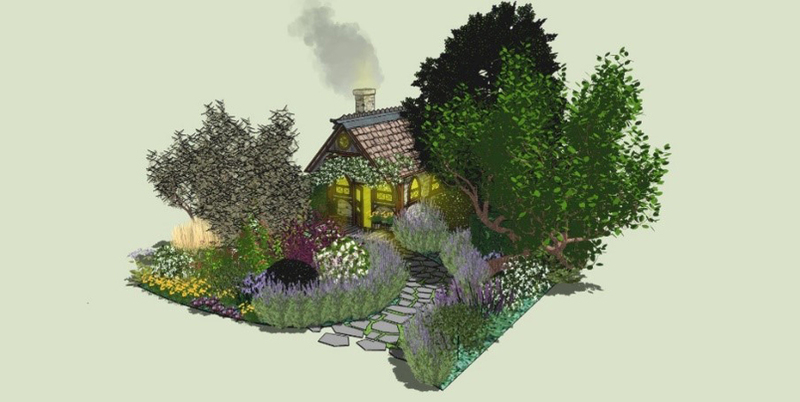 Pro-Gardens ‘CLIC Sargent‘ Garden, designed by Jamie Langlands, (pictured banner top of page) are creating a fantastical back garden created for a young family – to inspire imagination, adventure and memories with their children. The garden features a magic folly located in the rear of the garden, aimed at capturing childhood memories of adults while creating new ones for children. An old path, lined with lavender, meanders towards the folly, passing colourful herbaceous planting and characterful trees.